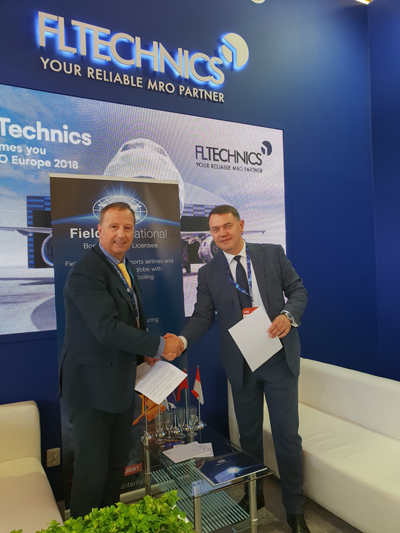 MRO Europe, Amsterdam: FL Technics, a global provider of integrated aircraft maintenance, repair and overhaul services, has announced signing a cooperation agreement with an independent global engineering enterprise Field International Ltd. Under the terms of this agreement, FL Technics shall act as an exclusive representative of Field International Ltd across Scandinavia, Russia, CIS, Mongolia. According to its Managing Director Richard Marples, the cooperation has opened up new markets for Field International. Having worked within the defence sector for over two decades, Field International Ltd is a dedicated Boeing, Airbus Helicopters and Airbus Defence and Space Tier 1 supplier supporting its customers around the globe. Not only does it serve a wide range of the existing products, but also assists in the production of tooling as well as the design and manufacturing of specialist equipment. “It is already a good tradition to have our cooperation expanded during the MRO Europe. It is great to feel mutual trust and understanding”, commented the CEO of FL Technics Zilvinas Lapinskas.